On Wednesday, October 8th, the Wolcott Volunteer Fire Department paid a visit to Wakelee Elementary School, as a part of National Fire Prevention Week. The fire captain spoke with the students on the importance of fire safety, checking smoke detectors, and having a home exit plan. The fire fighters showed the students all of their safety gear and explained how it keeps them protected in a fire. The students were able to touch the equipment, climb on the trucks, and see a live demonstration performed by the firemen. 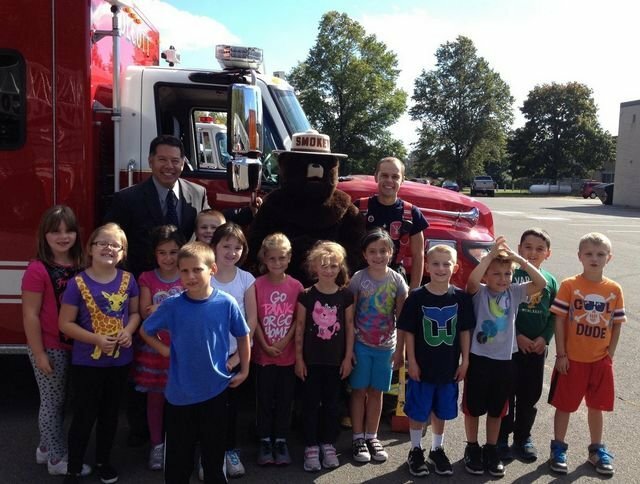 The event concluded with a vist from Smokey the Bear, who came along to pass out red firemen hats to each student.